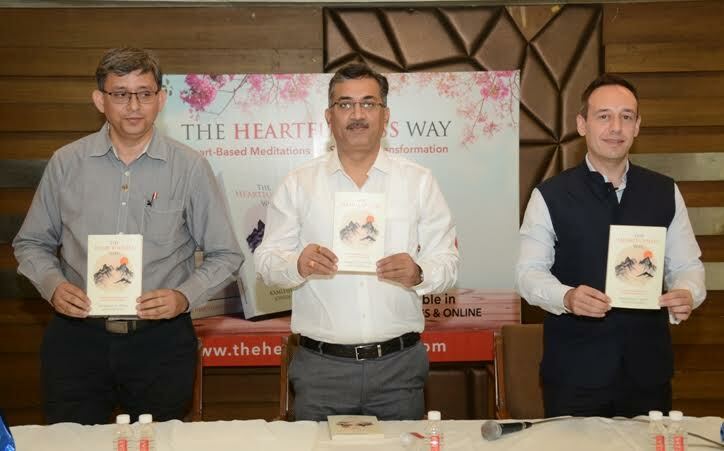 Ahmedabad: City Municipal Commissioner Mukesh Kumar today launched a book ‘The Heartfulness Way’ in presence of its co-author Joshua Pollock and Heartfulness trainer Kejal Kansara here. ‘The Heartfulness Way,’ first unveiled by the President of India, Shri Ram Nath Kovind, on 18 January 2018, is a book on Heartfulness techniques and principles authored by Kamlesh D. Patel, widely known as Daaji, the fourth global guide of Heartfulness, and his student Joshua Pollock, a Heartfulness practitioner and trainer. The book according to publication house, promises to be a treat for those who are interested in meditation and how it can transform our day-to-day lives. ‘Heartfulness meditation (www.heartfulness.org) is a practices for self-development that help us find inner calm and stillness in our extremely fast-paced world. The meditation practice is offered free across the globe. The easily adopted practices are appropriate for people from all walks of life, cultures, religious beliefs, and economic status, over the age of 15,’ the co-author said.